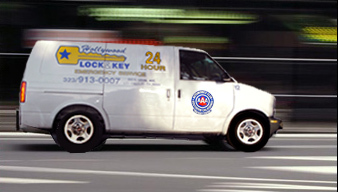 Hollywood Lock & Key has been providing locksmith services and products to the Los Angeles area since 1980. Our service technicians are highly trained and keep up-to-date with the latest locks and keys as well as the older standards to provide our customers with the best services possible. Our goal is to provide prompt and professional locksmith services and quality products to our customers. We offer mobile and in-store lock services, and staff professional locksmiths for your convenience. Need emergency services in the middle of the night? Dont worry! Our mobile services are available 24 hours a day, 7 days a week, 365 days a year. Please take a moment to browse through our website to learn more about our products and services. If you have any questions, please do not hesitate to contact us. One of our locksmiths would be more than happy to assist you.